"Change the game" you'll hear people say. In fact, we often define the game we play when we choose how to play it. But only some of us realize this fact. I was reminded of this lesson in Moscow by the French chess master, Joel Lautier. Joel and the rest of the team had to solve the problem before morning. Vladimir Kramnik would sleep, of course. He would need to be rested fully, and even then it would be a long shot to beat Garry Kasparov. The dominant world chess champion was unlikely to lose. But the team had an idea. Even if it worked just once - there were many games in the match - it might open up the smallest of chances. The team were all wiz kids, each a chess master in his own right. No one person could fully prepare alone for the many possibilities of a match at this level. So each of the grand masters had his team of trainers assigned to work out the best solution to a particular situation that might arise. By morning, each team member needed to have solved his problem and prepared the result of his analysis for presentation to Kramnik himself, who would scan the analysis and commit it to his marvelous mind. Few words were needed. Joel Lautier was on the team because he is one of the few to ever beat Kasparov. Lautier’s job was key: Formulate Kramnik’s best “black” opening. Many readers will know about the most well-known chess openings. But, in fact, there are many more possible openings than the common ones, and by its nature chess allows for the invention of new openings to this day. But in such an old and storied game, the chances of inventing an effective new opening are not great. That was Lautier’s task. 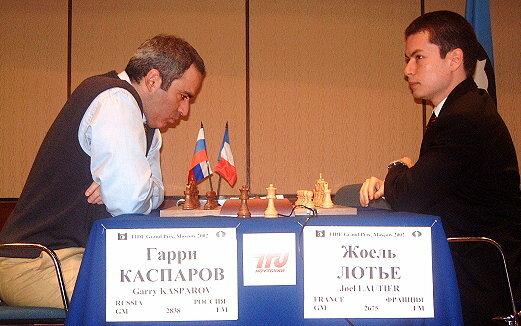 What made Lautier’s job especially important was that Kasparov was especially good at the attack. Key for Kramnik would be to find a way to improve his chances in the games where he started as “black”- second - since those games would favor Kasparov’s attacking ability. And he would need to be able to repeat the opening over several games as black, a tough job once the opening was revealed. Working into the night, Lautier formulated a risky approach for Kramnik. The opening was not ideal, but it might work given Kasparov’s strengths relative to Kramnik. It involved an odd series of moves, quickly leading to the trading of queens. When complete, the strategy - which has come to be known as the "Berlin" opening - left Kasparov, as white, with a slight positional advantage (with his players in slightly better places on the board). 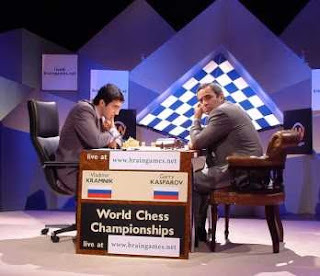 But the opening hurt Kasparov too, by skipping the complicated “mid game” where Kasparov famously had an advantage. The strategy worked. The opening shifted the edge enough for Kramnik to draw games that he would have otherwise lost. Several years later, when I was lecturing in Moscow, Joel Lautier was in the audience and he asked me this question: “There may be many possible winning business strategies. How do we know which is best?” The answer comes from Mr. Lautier's example. The best strategy plays to your strengths, and away from the other’s. Don't just play the game as defined; define the game you play. Research on "metacompetition," defining the game you play, appears in my book on Red Queen competition.